Grambling defender is first-ever SWAC soccer player invited to a USWNT training camp. GRAMBLING, La. 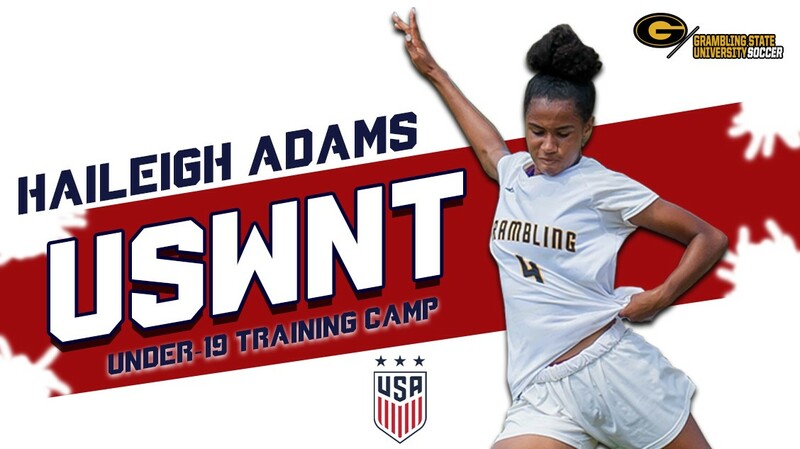 | Grambling State University defender Haileigh Adams has been invited to attend the United States Women’s Soccer National Team (USWNT) Under-19 training camp May 5-12 in San Diego, Calif.
Adams, who is a native of Pasadena, Calif., and is the first-ever Southwestern Athletic Conference (SWAC) women’s soccer player invited to a USWNT training camp, was instrumental in the Lady Tigers’ success during the 2017 season. Grambling State went from one win in 2016 to 11 in 2017 and finished second in the conference and concluded its season as runner-ups in the SWAC Tournament. She logged 1,800 minutes on a back line that posted eight shutouts. “She had an excellent season and is one of the most talented defenders in our region,” Lady Tigers head coach Justin Wagar said. “She does so many things for our team, from winning balls in the air, to organizing our back line, to covering mistakes when we have break downs, and setting up our offense with distribution from the back. Haileigh has amazing pace that enables her to run down scoring chances from opponents and snuff them out before they begin. The training camp will feature the U-18, U-19, and U-20 national team players with roughly 22 to 26 representatives per age group who will compete to make the full roster for the United States National teams. The U-19s will have a number of training camps and tournaments throughout the year. Camps are often scheduled to run concurrent with other YNT camps to give the players an opportunity to watch and play against older players and learn through those experiences.